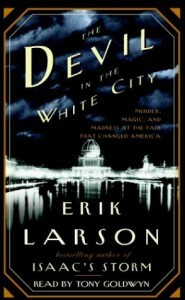 Some say that truth is stranger than fiction; while I don't know about that I can say that at times, such as in the reading of The Devil in the White City, truth is more compelling that fiction. Thanks to Hollywood and the crazy killers found throughout the history of fictional thrillers it is easy to be jaded when your presented with a smooth talking pharmacist who preys on young women. It is easy to not be horrified until you remember the story is real.